South Adelaide suffered a 44-point loss to North Adelaide at Prospect Oval on Saturday afternoon. Despite leading at quartertime, the Panthers were condemned to their fifth consecutive loss thanks to some inaccurate kicking in front of goal and poor skills and decision making in the field of play, eventually falling to a 7.16 (58) to 16.6 (102) defeat. The Panthers controlled much of the play throughout the first term, recording the first five scoring shots and holding the Roosters goalless right until the siren sounded for quartertime. However, despite their press holding the play in their forward 50 for most of the stanza, South Adelaide were unable to apply any real scoreboard pressure on the home side and only took a 16-point advantage into the first break. North came out the much-improved side in the second term. Their manic pressure and hard running helping them outscore the Panthers 6.1 to 0.4, with Lewis Hender looking ominous in the forward half as he kicked three goals for the quarter. The damage at the major break - a 34-point turnaround and North heading into the change with an 18-point lead. Daniel Bass opened the scoring in the second half with a brilliant long set shot, with less than a minute played. However, the Panthers would not register another major score until Ben Haren kicked his second in the 26th minute of the penultimate term. The Panthers did manage to get the scoreboard ticking over in the final term. However, continued inaccuracy in front of the sticks meant the visitors were unable to truly make much of an indent into the growing margin. Vice captains Matt Rose (28 possessions and eight marks) and Joel Cross (25 touches and eight clearances) were the major ball winners for the Panthers and fought with their trademark endeavour throughout the game. Xavier Gotch also continued his impressive form in 2017, collecting 19 disposals, six clearances and hitting the scoreboard with a goal. Speedy young gun Joseph Haines (19 touches, six marks and a goal) also continued his strong response since being sent back to the Reserves for a game. The only multiple goal scorers for the Panthers were Haren and Matthew Raitt, who each kicked two. Best for the victors was Tanner Smith (19 possessions, 10 marks and four goals) and Tom Schwarz (28 touches and eight tackles). The Panthers will look to return to the winners list this weekend against Central District on Saturday, July 8 at Hickinbotham Oval. South Adelaide's Reserves equalled their biggest winning margin of 2017, claiming a 65-point win over North Adelaide at Prospect Oval on Saturday afternoon. The Panthers now find themselves in the top five after recording their fourth win of the season, knocking off the second placed Roosters with a 17.9 (111) to 6.10 (46) victory. 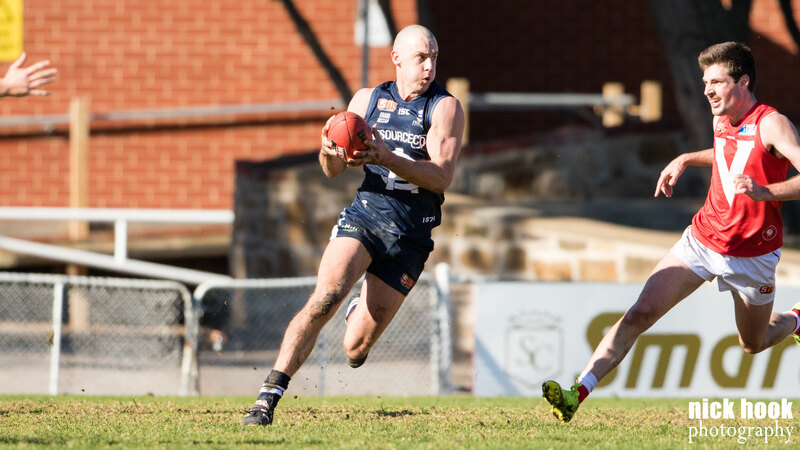 South Adelaide enjoyed the majority of the play in the first term, racing out to a 22-point lead, with the returning Adam Gulden finding plenty of the footy. In the second term, the Rooster wrestled back some of the ascendancy and only two points separated the sides at the major break. However, it was all South Adelaide in the second half, as the visitors outscored North 12.5 to 2.2 and pushed the margin to 65. Big American ruckman Alex Aurrichio was at his competitive best at the stoppages knocking 33 hit outs, while Henry Bruce, who was recently promoted from the Under-18s, continued to impress at senior level with 25 touches and two goals. In the rehab group, the rebooted Jake Veide (24 disposals, seven tackles and a goal) successfully navigated his return from a knee reconstruction, while Tyson Brown (24 possessions and eight marks), Roland Ah Chee (two goals) and Gulden (31 touches and two goals) all had an impact on the game in their returns. Youngsters Robert Badger and Ben Millman were also amongst the Panthers best performers. The Reserves are next in action against Central District from 11:30am, Saturday, July 8 at Hickinbotham Oval.